We are increasingly integrating the digital devices with our physical world. The amount of content produced today is growing exponentially, and so is our working relationships. To maintain a right balance and productivity in this scenario, it’s essential that people readily have access to the mechanism that can help them collaborate on team files from anywhere and on any device. To address this, Microsoft has introduced several new capabilities in its popular cloud service – OneDrive for Business. 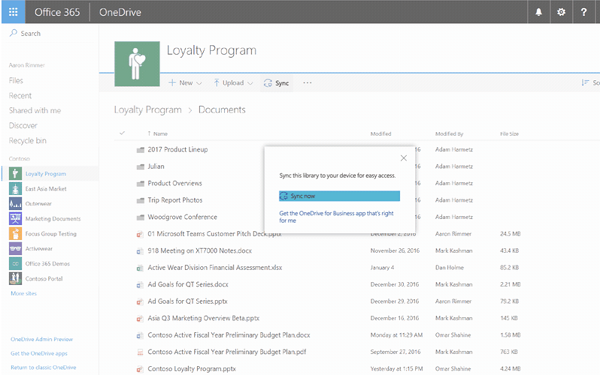 The newly introduced features for Microsoft OneDrive for Business will enhance collaboration and management of content. To be precise, these new features will streamline the task of sharing, collaborating and syncing content you store to OneDrive. Microsoft has decided to upgrade OneDrive with the ability to sync SharePoint Online team sites. The main benefit of adding this capability – You can now work with all your Office 365 files just like files stored on your PC or Mac—even when you are offline. OneDrive intends to make it easier for its business customers to collaborating on content that is shared with others. For this, the service is offering a new onboarding experience. It will guide the users through some of the most common activities like uploading documents, using the mobile app and collaborating with others. Home – Most recent Office 365 Message Center posts and usage reporting related to OneDrive will now be displayed under ‘Admin center’ dashboard. Storage – Options related to storage will now allow users to easily set default storage limits and document retention durations. Device access – This feature will enable user’s control over how other members in a team can access files via simple allow/deny permissions. Compliance – It will offer instant access to Office 365 Security and Compliance Center links for managing key tasks such as auditing, data loss prevention, retention, and eDiscovery. For more, visit Windows Blog. Share your experience with us in the comments section below.